THEY evoke metal gorillas in a cavernous, floodlit hall: 640 robots with riveting guns and arms for handling parts. They will spring into action this autumn at the opening of a new plant for Jaguar Land Rover (JLR), built at a cost of €1.4bn ($1.6bn) on former farmland in Nitra, in western Slovakia. Cars under construction will travel along 3.9km of elevated maglev track, taking just two days from start to completion. The robots, together with 2,800 human workers, will assemble a Land Rover Discovery every two minutes. JLR is just the latest carmaker to come to Slovakia. VW arrived 27 years ago, followed by Kia and PSA. The firms together churn out over 1m cars annually, more per head of population than any other country. JLR considered 30 or 40 locations, says Alexander Wortberg, who oversees operations at Nitra. Mexico has cheaper workers and (for now, at least) favourable access to the American market. But Nitra is close to a new motorway and Slovakia has an impressive supply chain, with more than 300 factories making car parts. The new JLR factory gives a fair picture of Slovakia’s, and more broadly central Europe’s, model of development. First, it was built with foreign capital and largely by foreign contractors. Signs for Bouygues, from France, and Takenaka, from Japan, hugely outnumber those for Dynamik, a local building firm. Membership of the EU has facilitated the flow of capital from the bloc’s western members to its eastern ones. Second, it depends on customers in economies to the west slurping up goods made relatively cheaply in the hinterland. And third, government support was essential. Last year the European Commission said it was checking if the €125m JLR received broke the bloc’s state-aid rules. Such subsidies are common in central Europe. Investors flock to special economic zones across the region, lured by tax giveaways. EU funds boost investment in infrastructure that appeals to foreign investors, like roads and rail. Even in Poland, the region’s biggest and most diversified economy, this money matters. It will be nearly 3.5% of GDP and 10% of public spending each year until 2022, reckons Pawel Borys, head of Poland’s development fund. In Hungary it added spending worth an average of 5% of GDP over the five years to 2015. This foreign-led development model has had much success. Countries from the Baltic states in the north to littoral Black Sea states have become considerably richer over the past two decades (see map). GDP per person in the Czech Republic is now close to that in Spain. Bulgaria and Romania are much poorer, but managing to win investment and grow, too. The European Commission tracks the progress of five EU members immediately east of Germany and Austria (the Czech Republic, Hungary, Poland, Slovenia and Slovakia) compared with a group of four wealthy “frontier” EU countries (Austria, Denmark, the Netherlands and Sweden). 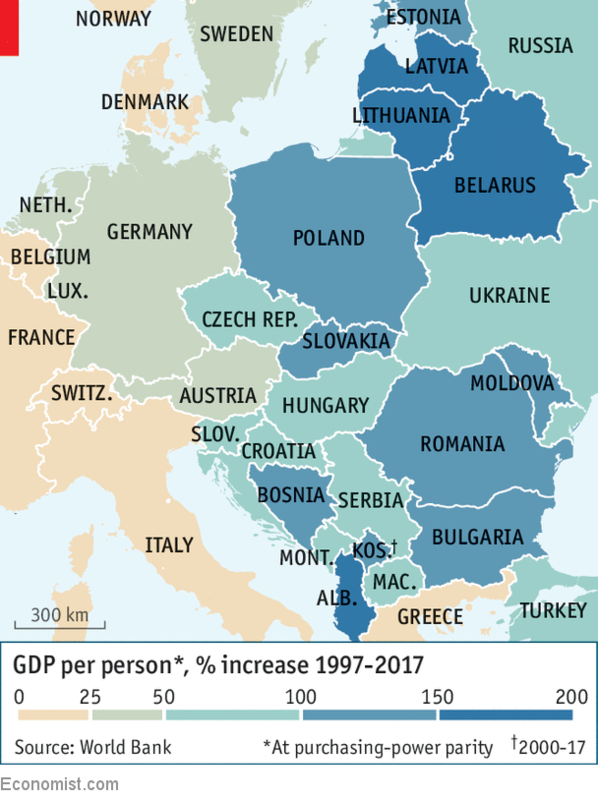 In 1995 average GDP per person (at purchasing-power parity) was around 55% lower in the five central European countries than in the frontier countries. By 2016 the difference had shrunk to 39%. Average incomes in the five countries are now equal to those in Portugal and far above those in Greece. Slovakia saw the most dramatic gains. But the challenge for these countries—as for any hinterland reliant on supplying labour to produce goods for richer neighbours, maquiladora-style—is to keep closing the income gap. The next stage of development is bound to be harder, requiring more productive firms, more private capital and more skilled labour. It is not clear that central Europe is ready. For now, the good times roll. The region is growing strongly once again. The IMF expects these countries to expand by an average of some 4% this year, nearly twice as fast as western Europe. This expansion looks more sustainable than the last one, which ended with the 2007-08 financial crisis. Back then, cheap foreign loans, including Swiss-franc mortgages taken out by individual households, had boosted consumption but quickly became hard to pay off. Today banks are in better shape, investment plays a bigger part in growth and consumption is supported less by debt and more by rising incomes. The region’s increasingly nasty politics have taken some of the shine off the EU’s eastward expansion. But so far foreign companies seem unruffled. Though Viktor Orban, Hungary’s prime minister, is an illiberal authoritarian, Mercedes Benz announced an investment of €1bn in the country two years ago and plans to make 330,000 cars yearly by 2020. Though Poland’s nativist government is hostile towards immigrants and, on occasion, the rule of law, foreign capital keeps coming and annual GDP growth has touched 5%. Anti-corruption protests toppled Slovakia’s prime minister in March. Even so, “corruption or political instability doesn’t deter investors when other conditions are good,” says a consultant at Vienneast, a business-risk analyst. Building firms are doing particularly well. Construction activity in the region has typically grown twice as fast as GDP in recent years, says Thomas Birtel, the boss of Strabag, Austria’s largest building company. Central Europe accounts for a fifth of its business; bright prospects there help explain why its share price has risen by two-thirds in the past three years. Business in Poland has gone so well that Strabag is branching out from EU-funded infrastructure into hotels, shopping centres and office blocks. Weinberger, a building-materials supplier, has 64 plants across eastern Europe (if you include Austria and Turkey). A spokeswoman for the firm says 30% of homes in the region are not connected to a sewerage system, compared with just 5% in western Europe. Hungary has been headiest of late, as Mr Orban scrambled ahead of an election to build roads, tunnels and bridges. Subsidies for better housing have meant a boom in brick sales. Services are playing a bigger part in this expansion than in the pre-crisis boom. Cornelius Walter of McKinsey, a consultancy, says white-collar work is doing well. Western banks are moving back-office jobs east to pleasant, affordable spots such as Krakow. JPMorgan Chase is putting 2,500 jobs in Warsaw; Goldman Sachs is recruiting there. McKinsey itself has 1,000 analysts in Poznan in central Poland, serving clients globally. Brexit will probably mean some mid-level finance jobs move from London. Poland’s Association of Business Service Leaders already counts 750 firms, most foreign-owned, in business services, employing 265,000 people. Fritz Mostbock of Erste, an Austrian bank with 16m customers in Poland, the Czech Republic, Slovakia, Croatia, Serbia, Romania and Turkey, says it expects banking in central and eastern Europe to grow faster than in western Europe for years to come. Central Europe has transformed Vienna Insurance Group, a 194-year-old institution, says a spokesman. Its 21 companies across central and eastern Europe now provide half of all VIG’s premiums and profits. “As incomes rise, spending on insurance goes up,” he says. It seems, then, that central Europe’s Goldilocks economies are well set for sustainable growth. But there are three reasons to worry: a lack of innovation in local firms, a coming demographic squeeze and an over-dependence on foreigners, especially German ones, to drive development. The first concern is illustrated by how few locally owned, non-state firms can compete with foreign ones. Sazka Group is one, but it is small. A Czech operator of lottery companies at home and in Greece, Italy, Cyprus and Austria, it has shown rare foreign ambitions. Last year it generated some €500m in revenues and employed 5,600 staff. Robert Chvatal, its boss, talks of plans to list in London, to raise capital for further expansion. Cord Prinzhorn, the boss of Prinzhorn Holding, an Austrian packaging and recycling firm that has invested €650m in central and eastern Europe in a decade, says rivals do pop up, notably in Poland. But not many, and none has grown big. The few big domestic firms are state-owned behemoths left over from pre-capitalist days, such as PKN Orlen, a Polish oil refiner with a market capitalisation of over €8bn. The region is in large part a back office and workshop for western Europe, says Richard Grievson of WIIW, a think-tank in Vienna, and is reliant on companies created and based elsewhere. He worries that, though open capital accounts and lashings of foreign direct investment have helped it to grow up till now, they are not a strong basis for further development. More needs to be done to encourage innovation, says Marcin Piatkowski of the World Bank. He thinks universities and governments could help by promoting better management. Officials should be quicker, he reckons, to choose startups that get grants for research and development or help in scaling up. Jadwiga Emilewicz, an economy minister in Poland, claims that the country’s firms are being prodded to move up value chains. Spending on research and development reached 1% of GDP last year, up from 0.5% in 2016. The goal is 2.7% by 2021, in line with America, Germany and Sweden, the world leaders. An “innovation act” will give tax benefits to firms that commercialise research, among other pro-business measures. Other countries in the region have similar goals. A more immediate difficulty is finding skilled, competitively priced labour. A building boom has soaked up workers. Mr Wortberg of JLR has just hired his 1,000th employee. Most are Slovaks, but he foresees having to import staff, though bureaucrats make that difficult. The squeeze is only going to get worse. Ageing populations, continued emigration and widespread hostility to migrants mean workforces are soon going to shrink. Old-age dependency ratios across the region are already rising fast, and in the coming two decades will soar (see chart). Labour markets are rigid. People in rural areas are reluctant to move for a job, which helps keep participation rates low. Older people, who are more likely to live in villages than youngsters, are the least likely to work: according to Eurostat, less than half of Polish 55- to 64-year-olds have jobs. At the plant in Nitra, Mr Wortberg thinks that the difficulty of finding housing means that workers do not move. Populist policies compound the problem. 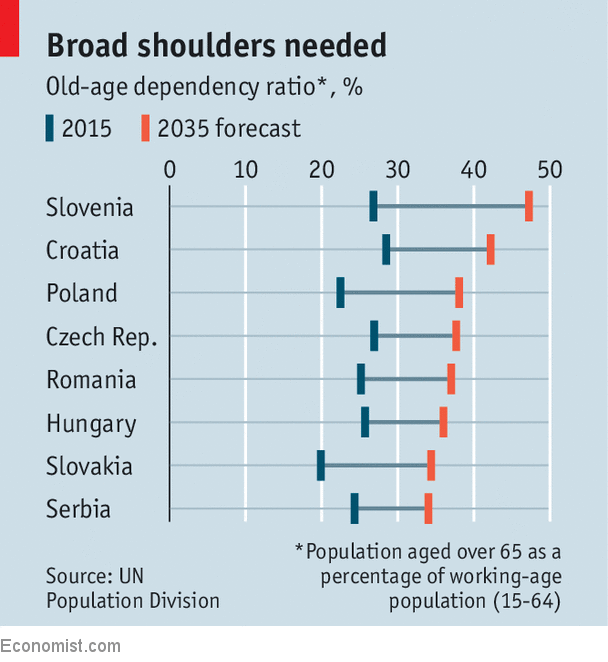 Last year Poland lowered the retirement age, immediately limiting the labour force. The number of employed Poles rose by a mere 135,000 in 2017, a pitifully small gain in a country with an 18m-strong workforce experiencing an economic boom. Poland has 152,000 vacancies, with construction, IT and transport firms most in need. In the Czech Republic there are around five vacancies per 100 people employed, the highest rate in the EU. “Companies’ main problem is a lack of workforce, especially skilled workers,” says Adam Czerniak of Polityika Insight, a think-tank in Warsaw. If central Europe succeeds in moving up the value chain, the coming demographic crunch will matter less, as more productive workers will find it easier to support a growing dependent population. But making that happen will require doing more to create a skilled workforce. Apprenticeship schemes and vocational education of the sort common in Germany, Switzerland, Singapore and the Nordic countries, are rare in central Europe. All the while, tight labour markets mean fast-rising wages, at least in cities. In Poland salaries are rising by an average of 7% yearly, far above inflation, says Mr Borys. Wages in Prague are close to those in Austria, notes an official at the Austrian central bank. Mr Birtel at Strabag, the building firm, says he expects wage growth to push up costs of materials and subcontracting work, and thus to eat into profits. Higher wages spread economic benefits, especially as many salaries used to be desperately low. But unless workers also become more productive, rising wages will make the region less appealing to investors. Mr Grievson predicts that central Europe’s demography will limit growth from the 2020s on. Even before then, the region’s close links with western Europe leave it exposed to any change in policies or financial conditions there. Its reliance on exports means that any softening of demand to the west would be felt quickly. If President Donald Trump’s threats to put higher tariffs on American imports of European-made cars become reality (see article), its car and auto-parts manufacturers would soon suffer. It could also be hit as monetary policy tightens in the euro zone, since rates are set to suit larger, richer countries rather than those to their east. What is more, the next round of EU cohesion-policy funds, to run from 2021 to 2027, will be much less generous to central and eastern Europe than the current one, which started in 2014 and runs until 2020. Proposals published by the European Commission in May would give Poland, for example, €64bn, down from €84bn in 2014-20. That is partly because central Europe is comparatively richer than it used to be. It is also because Brexit will cut the EU budget and because western Europeans are peeved at populists to the east refusing to help share the burden of refugees. Central Europe has benefited greatly from integration with countries to the west. But its dependence on exports and EU funds is also a source of vulnerability. It needs to plan for what might replace them. ← Pruitt Is Gone. But These Five E.P.A. Policy Battles Are Still Ahead.